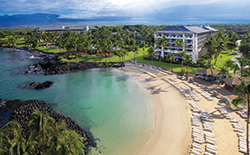 Protected by five sacred mountains, graced by sunshine, seashore and sea turtles, The Fairmont Orchid, Hawaii, offers elegant accommodations and a variety of fine dining options amid the natural beauty of the Big Island. Relax around the 10,000 sq.ft. oceanfront pool or enjoy an outdoor massage at the Spa Without Walls. And for the more energetic traveler, the Orchid Beachboys share an intriguing culture of outrigger canoes, surfing, snorkeling and adventures on a sheltered white-sand beach, while dramatic black lava frames 36 holes of championship golf. And for your Keiki, year-round Keiki children's program and Hawaiian arts & crafts are available to enhance your child's Hawaiian vacation experience at The Fairmont Orchid. Offer valid for booking now through 12/20/19 for select travel 1/7/19 - 12/20/19. Rate is per person, land only, based on double occupancy for check-in on 2/3/19, in room categories listed. Unless otherwise indicated: rates quoted are accurate at time of publication, & are per person, based on double occupancy. Airfare, taxes, surcharges, gratuities, transfers & excursions are additional. Advertised rates do not include any applicable daily resort or facility fees payable directly to the hotel at check-out; such fee amounts will be advised at the time of booking. Rates, terms, conditions, availability, itinerary, government taxes, surcharges, deposit, payment, cancellation terms/conditions & policies subject to change without notice at any time. Cruise rates capacity controlled. Other restrictions may apply, including, but not limited to baggage limitations & fees, standby policies & fees, non-refundable tickets & change fees with pre-flight notification deadlines, & blackout dates. Fees & policies vary among airlines. Contact your travel advisor for any details or questions. Not responsible for errors or omissions.